Good morning everyone. Today being the vernal equinox, spring is here and so with it the rising hope of warmer weather and the rising sap in the trees. Knowing that winter has officially passed most folks look for flowers. Our crocuses (is it croci??) are still under a few feet of snow. 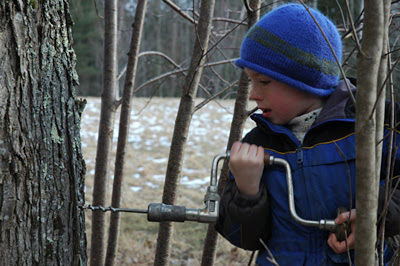 It is time to tap and time to get the sap boiler up and running. There is still plenty of snow in the woods and around around our house where we live in the woods. The driveway is ankle deep in mud ,the songbirds are showing up at the feeder, ole man porky pine has taken up residence in one of the kids climbing trees and the sap is flowing. 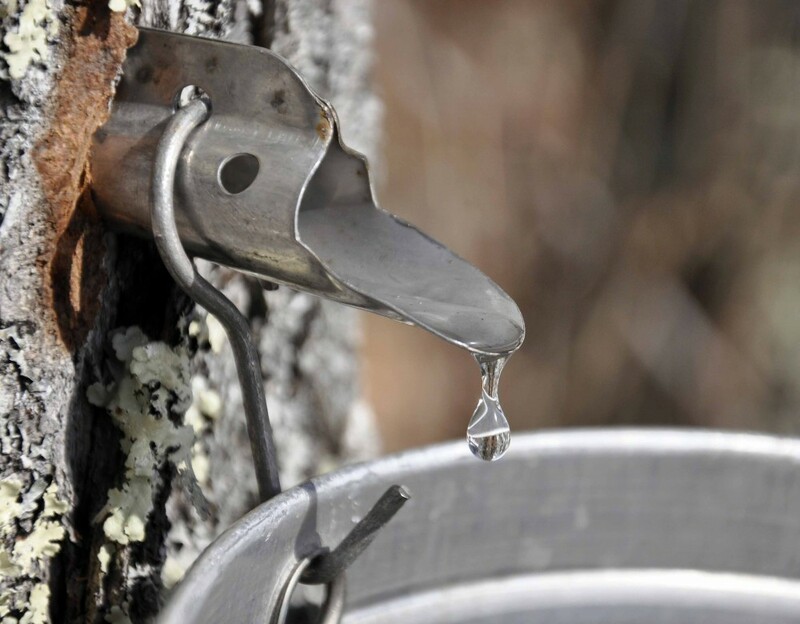 Maine Maple Syrup weekend is just a few days away! At a ratio of 40 gallons of sap to1gallon of syrup our red maples in dooryard produce what we fondly call “liquid gold”. This year’s fuel for the sap boiler will be free range, organic pine and hemlock limbs taken down for us during the ice storm at Christmas. The real wood-fired professionals use hardwoods such as maple, oak, beech and birch cut, split and stacked a year or so ago. Another tradition we have here is pancake Sunday. Sawyer wanted to share with all you one of his favorite recipes. , 1 t. vanilla, and a lot of maple syrup warmed on the back of the woodstove. Cut the butter into 3 equal parts. Melt two of the pieces in a pan and save the third part for cooking the pancakes. Mix in a bowl the flour, sugar, baking powder and salt. Mash the banana in a different bowl. Add the milk, eggs and vanilla to the banana. Then mix the dry mix to the banana mix. Batter should be a little lumpy. Spoon batter on griddle and cook until a few holes form on top of each pancake and flip. They should rise a little and turn golden brown. Serve hot with warm syrup. Enjoy! Posted in camden windjammer cruises sailing vacations on March 20, 2014 by Capt. Barry.